Startup activity bounced upward in 32 of the 50 U.S. states last year, and 18 of the nation’s top 40 metropolitan areas also saw increases in new venture activity, according to the 2015 Kauffman Index: Startup Activity. The reports on states and metro areas, released today, followed the May 28 report on national startup activity. In overall startup activity, all cities that ranked in the top 10 with the most startup activity in the 2014 Index remained in the top 10 in the 2015 Index. The top 10 metros were, in this order, centered on the cities of: Austin, Texas; Miami, Fla.; San Jose, Calif.; Los Angeles; Denver; San Francisco; New York; Houston; San Diego; and San Antonio, Texas. The rate of new entrepreneurs, one of the components of the Kauffman Index, varied widely across metropolitan areas, from 0.55 percent to 0.13 percent. Austin, Texas, came out on top, at 0.55 percent rate of new entrepreneurs, or 550 new entrepreneurs per month on average, followed by Miami at 0.52 percent and San Jose, Calif., at 0.41 percent. Opportunity share, which measures the percentage of new entrepreneurs not coming out of unemployment and is a proxy that can help identify companies that are driven by market opportunity, revealed a divergent range of results among metros. San Jose – often considered the heart of Silicon Valley – ranked highest, with an opportunity share of 91.2 percent. On the other end of the spectrum was Nashville, with a 60.0 percent opportunity share. Startup density, considered a key indicator of vibrant entrepreneurial communities, tracks new businesses rather than entrepreneurs. Metros’ density range among the top 40 metros stretched from the lower end – 93.9 startups per 100,000 people in the Cincinnati, Ohio, metro area – to the high end – 247.6 startups per 100,000 people in metropolitan Miami. Although startup activity tended to be highest in the western and southern states overall, the five states that ranked at the top of the 2015 Index were Montana, Wyoming, North Dakota, Colorado and Vermont. In the 2015 Index, the rate of new entrepreneurs varied from 0.17 percent – or 170 entrepreneurs per month for every 100,000 adults – in Wisconsin to 0.54 percent in Montana. Western states, including California, Nevada and New Mexico, fared particularly well on the rate of new entrepreneurs in the 2015 Index. Opportunity share also revealed a divergent range of results between states. At the low end in the 2015 Index, Alabama had a 69.0 percent opportunity share of new entrepreneurs, which means that approximately three in 10 new Alabama entrepreneurs came directly from unemployment. On the high end, Idaho had a 90.3 percent opportunity share, or just one in 10 new entrepreneurs starting their businesses when they were unemployed. States’ startup density range in the 2015 Index spans from the low end of 81.4 startups per 100,000 people in West Virginia to the high end of 244.7 startups per 100,000 people in North Dakota. The Kauffman Index of Entrepreneurship is the first and largest index tracking entrepreneurship across city, state and national levels for the United States, and also presents demographic characteristics of the business owners. 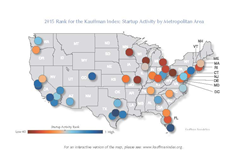 The Kauffman Index: Startup Activity is the first of three reports to be released under the umbrella of the new Kauffman Index of Entrepreneurship. Future topics include “main street” businesses and growth ventures. The 2015 data allow for an update to annual reports dating back to 1996. Interactive data spanning all 18 years is available at http://www.kauffmanindex.org. Follow the conversation on Twitter at #KauffmanIndex.